The INDU Model delivered rising and hefty profits. 2010 was another meagre - but non negative - year, as the Dow oscillated trendless for most of the year. The DTIM’s profits peaked on April 28. The model subsequently accumulated losses that reached $21725 by July 14, then recovered. The year ended with a small gross profit: $2,769. The model placed 230 bets in 252 trading days: it went flat 22 times (9%), long 153 times (61%), and short 77 times (31%). There were 80 round trips. The forecasts were correct only about 51% of the times. “Long signals” generated a profit of $8,284, but “Short signals” generated losses of $-5,515. Winning trades generated profits totalling $85.787, and losing trades generated losses of $83,018. 2009 was a “bad” year for the Day Trading Indu Model, which nevertheless managed to report a small gain. Volatility was low, and there was a major trend inversion. The INDU model gained 1,882$ per Dow future trades over 252 trading days. The DTIM issued 125 "long" signals, 16 "flat" signals, and 111 "short" signals, producing 83 "round trips" [hence, if commissions paid on a round trip are $8, the cost of commissions was $664, further reducing the annual profits]. The Model's forecasts were right 121 times (51.3% excluding flat forecasts) winning a total annual amount of $122,224 per Dow future traded (50.1%). The model issued a wrong forecast 115 times (48.7%) losing a total of $111,821 (49.9%). "Short" signals produced a total annual loss of $6,767, while “Long” signals produced annual profits amounting to $8648. The worst losing streak amounted to about-$10,000. Year-end profits reached $1,882 per Dow future traded. 2008 marks a return to the (very profitable) volatile trending markets that characterised the late "90s. This is the ideal environment for the Day Trading Indu Model. The model gained $19,684 per "Dow future" traded in the first quarter, and continued to gain until the end, except for an awful October (see the Monthly Table below). At the closing bell of 253 trading days in 2008, the DTIM issued 122 "long" signals (48%), 32 "flat" signals (13%), and 99 "short" signals (39%), producing 80 "round trips" [hence, if commissions paid on a round trip are $8, the cost of commissions was $640]. The Model's forecasts were right 120 times (54.3% excluding flat forecasts) winning a total amount of $211,474 per Dow future traded (57%). The model issued a wrong forecast 101 times (45.7%) losing a total of $160,198 (43%). When "flat" signals were issued, the actual Dow variation was on average only 75% of the change that occurred in other trading days; and daily volatility [ High(t) - Low(t) / close(t-1) ] was only 1.79% compared with 2.82% in other days, showing that the "flat" signal has some predictive power on the daily volatility, however defined. Not surprisingly - given the negative market trend in 2008 - "Short" signals yielded 92.7% of total annual profits, whereas "Long" signals were barely profitable (+$3,747). Between Sept 29 and Nov. 11 the DTIM had its worst losing streak ever: -$28,100. But year-end profits reached $51,276 per Dow future traded. What a ride! Annual profits amount to $8711 per DJIA future traded, net of commissions. They would be higher in actual trading, if stop losses were used: for example, the DTIM was "long" - and lost $4153 - on February 26, when the Dow crashed. The gains were concentrated in the first six months of the year. In the second semester a difficult trading range emerged, as the Dow prepared a 2008 bear market: the D.T.I. model lost (only) about -$1000 and finished the year with a +$8711 gain. In the 2nd semester, thus, the D.T.I.M. showed once again its resilience in times of adverse (non trending) market behaviour. (see Table below). The model issued a "flat" forecast 23% of the times, went long 45%, and short 32% of the times. Forecasts were right 98 times, wrong 93 times. 2006 was a weak year for the DTIM. In the first five months the DTIM gained steadily: but the trading range was too hard to trade in June, when heavy losses in some highly volatile days almost erased the gains accumulated since January. Annual profits were lifted by Q4's trending market, reaching $5,903 (gross, 23.6% of the suggested $25.000 "money at work" at the beginning of the year) per "10$-Dow-Future" traded. In 2006 the D.T.I.M. was "long" in 141 trading days, "short" in 72 trading days, and "flat" in 39 trading days: it went 72 times on a round-trip. Forecasts were right 112 times, wrong 100 times. The actual Dow went up in 137, and fell in 115, of a total 252 trading days. In the first quarter of 2005 the U.S. stock market went into a side-trend. The special features of the D.T.I.M. avoided the usual losses of computer-based models in these kind of markets. Actually the 1st semester ended with a gross profit of $4015 for Dow future contract traded, due to the "Short" bias which rewarded the model in April. Summer further lifted - slightly - the model's profits. The early activation of trend-following devices in the last quarter boosted revenues when prices broke on the upside. Annual profit was $10,323 per future traded. The Daily Model gained $6460 in the first half of 2004, and lost about $8,500 in July, August and September 2004. In the first ten months of the year the N.Y.S.E. went side-trending: that is the hardest kind of market to forecast on a daily basis. The Dow and the S&P500 rallied after Nov. 4th: the new trend helped the model to improve its performance and bring the 2004 performance into the black once again (+$2,684, roughly 10% of the capital at work, the worse result in years). The Daily Model recovered in May from early losses (in a side trend) and finished in the black. The annual profit was $9500 per future traded. The Daily Model profited from the sharp downtrend that developed in March and the sharp October rebound, posting an annual profit of $18,379 per future traded. 2002 was the last of a number of year with a high stock market volatility. 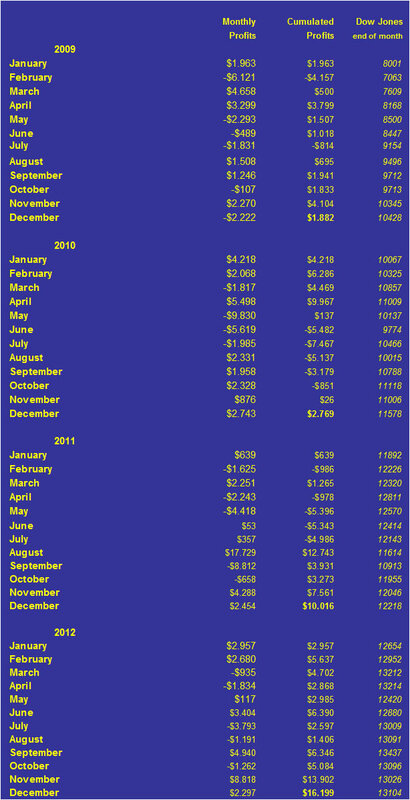 The table below reports the monthly behaviour of the INDU Model since this website appeared. In the 2nd column, "Monthly Profits" are Dow Jones Industrial Average "Units", gained or lost by the model. Performances are "theoretical, out of sample": which means that neither commissions nor slippage, transmission errors, accounting costs, interest on margin deposit, etc., are included. Some features of the model's usual behaviour may be observed. First, the Model may gain in both bear and bull markets, provided of course that its forecasts are correct. This means that its advantage over "buy and hold" investment strategies is magnified in bear markets. Second, gains emerge consistently only on a 6-12 month basis. One consequence is that daily trading is often frustrating, as profits may not come for many many weeks, and then flow in suddenly and rapidly.